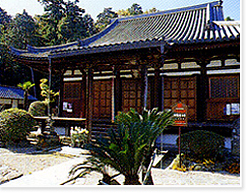 Hodoji Temple is said to have been founded by the High Preast Gyoki in the Nara period (710-794). The main hall was completed early in the Muromachi period (1337-1573) and is now designated as an important cultural property of Japan. In the inner section of the main hall, murals such as the Preaching Buddha are on display.